During 2010-15, most of the North African countries such as Egypt, Libya, Sudan & Sudan have witnessed weak economic conditions due to internal social and civil unrest, plunging oil price, continuous depreciation in currency and insufficient investments. As a result, construction industry faced challenges, which affected the market growth of air conditioner market. North Africa Air Conditioner Market is projected to grow at a CAGR of 5.55% during 2016-2022. Demand for air conditioners in the coming years would be recorded from residential and commercial markets. In 2015, Egypt has contributed the major revenue and volume share followed by Algeria and others. In North Africa air conditioner market, mini-split segment has dominated the overall market and is expected to maintain market dominance through the forecast period. Amongst all end users, residential acquired largest revenue share in all the North African countries. The report thoroughly covers the air conditioners market by AC types, applications and countries. The report provides the unbiased and detailed analysis of the on-going trends, opportunities/high growth areas, market drivers, which would help the stakeholders to decide and align their market strategies according to the current and future market dynamics. 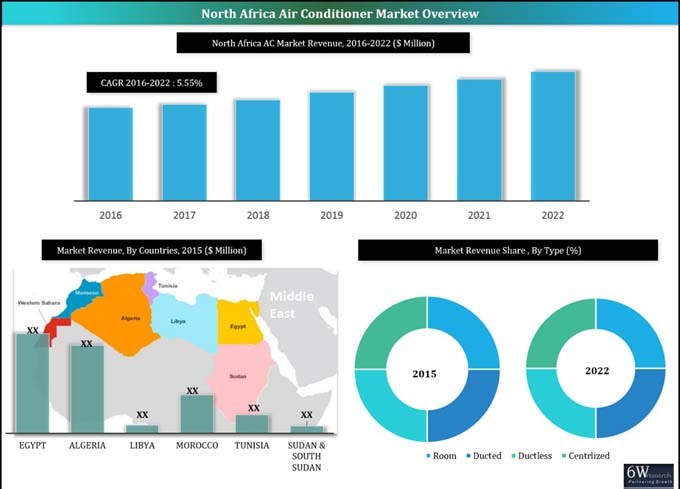 • Historical & Forecast data of North Africa Air Conditioner Market Revenues for the Period 2010-2022F. •	Historical & Forecast data of Egypt Air Conditioner Market Revenue for the Period 2010-2022F. •	Historical & Forecast data of Algeria Air Conditioner Market Revenue for the Period 2010-2022F. •	Historical & Forecast data of Morocco & Western Sahara Air Conditioner Market Revenue for the Period 2010-2022F. •	Historical & Forecast data of Sudan & South Sudan Air Conditioner Market Revenue for the Period 2010-2022F. •	Historical & Forecast data of Libya Air Conditioner Market Revenue for the Period 2010-2022F. •	Historical & Forecast data of Tunisia Air Conditioner Market Revenue for the Period 2010-2022F. 13.8 Midea Group Co. Ltd.
13.9 Zamil Air Conditioners Holding Co. Ltd.
13.11 GREE Electric Appliances Inc.